SHAWNEE on DELAWARE, PA – Compile a collection of entrepreneurs with a vision and a zeal for golf, and you get something special. That’s certainly the case at the Shawnee Inn and Golf Resort, located along the Delaware River in northeastern Pennsylvania, just across from the New Jersey state line (about two hours from Philadelphia). Demonstrating a commitment to the game of golf, there is a practice putting green right in front of the entrance to the Shawnee Inn. “Over 100 years ago, C.C. Worthington, an engineer from New York with a passion for golf, built a remarkable resort. He made two decisions that solidified the future of what was known as The Buckwood Inn and Shawnee Country Club. “One, build the anchor of the resort, the Inn, out of floors and walls made of 12-inch concrete reinforced with iron. “Second, hire A.W. Tillinghast to design an 18 hole golf course on the adjacent Shawnee Island. 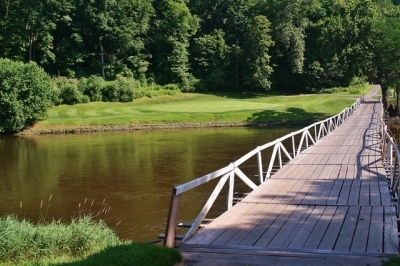 The bridge connecting the mainland to the Shawnee golf island is iconic. The Blue 7th hole is in the background. “During the Worthington era, golf was a focal point of the resort activities -- so much so that in 1938, Mr. Worthington and Shawnee hosted the PGA Championships. In the final match, Sam Snead narrowly lost to Paul Runyon. Throughout the early years of the resort, many notable golfers played the now famous private island course. “The second owner, Fred Waring, was also an enthusiastic golfer. Shawnee was the best of both worlds for Waring, as he could enjoy his favorite game, golf, and continue to be active in the entertainment world. “Fred Waring had many celebrity friends that visited Shawnee over the years, including Bob Hope, Art Carney, George Goebel, Arnold Palmer, Lucille Ball, Ed Sullivan, Eddie Fisher, Perry Como, and President Dwight D. Eisenhower -- but none caught Waring’s enthusiasm for golf like Jackie Gleason. “In 1959, Jackie attempted his first game of golf, scoring a 143. However, only 15 months later, with practice and lessons, Jackie Gleason shot an amazing 75. 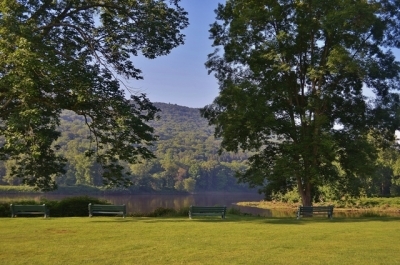 Take a seat on the benches and enjoy the serenity of the Delaware River. “In addition, it was during the time of Fred Waring’s ownership that Bill Diddle, golf architect, helped turn Shawnee’s 18 holes into 27. “Closer to the present, the third major owner, Charles Kirkwood, also believes that golf at Shawnee is special. The layout, unique location and rich history make it a course like no other. 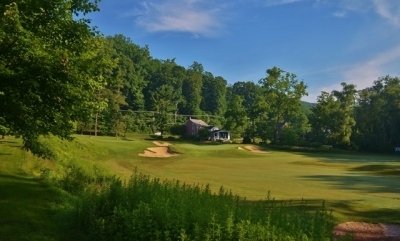 “Kirkwood’s reinvigorated focus on golf includes the opening of the Tillinghast Golf Academy for professional instruction, our 6-hole Approach Course lit for night play, and our continued attention on the improvement of our 27-hole PGA Championship course. 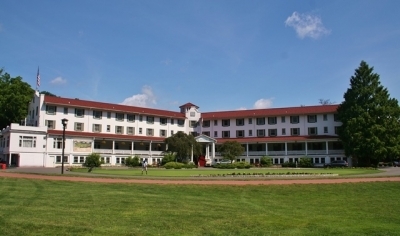 The expansive Shawnee grounds are perfect for weddings and other large gatherings. Upon visiting the Shawnee Inn, you’ll appreciate Kirkwood’s dedication to improving the property, which began with upgrading the guestrooms and common areas. But you’ll also see it in the staff at Shawnee, and the family atmosphere all around. You can always tell the way the owners treat the staff by their general attitude – and everyone’s happy at Shawnee. Kirkwood purchased the Inn in 1977, and his plans for the future include continuing to improve the historic Inn, taking meticulous care of the Shawnee “golf island” and increasing the branding of Shawnee as a golf destination in combination with Great Bear Golf Club. 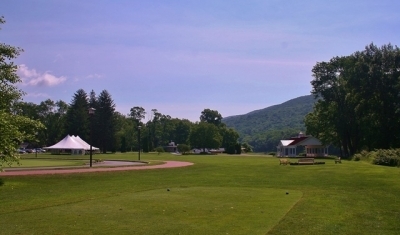 Great Bear is located a few miles from the Inn, and is included in golf packages. Clearly the focal point of golf at Shawnee is the Tillinghast golf course, but the aforementioned Tom Doak designed short course should not be overlooked. The Tom Doak-designed short course is a great place to practice your short game. Howell says the short course was built to strengthen the golf brand at the resort, and its addition has allowed Shawnee to add instruction by using part of it for a practice facility. Oddly enough, one aspect of the history at Shawnee isn’t quite so celebrated, that being the serious floods that have afflicted the resort in the past couple decades. 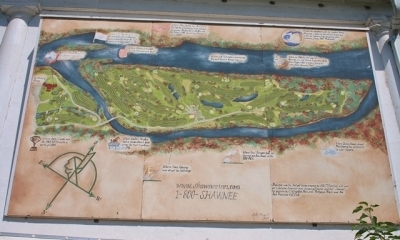 A large sign shows the layout of the Shawnee golf island, and reveals some of its history. The first took place in January, 1996, when a heavy regional snowfall was then followed by a period of milder weather and heavy rains – which swelled the Delaware River high above its normal flow and flooded the Inn and nearly wiped the golf course off the island. As a result, the Inn was closed until mid-April and golf reopened in mid-May. Then there was a period from September of 2004 to June of 2006 when the river overflowed a total of three times. Each time the Inn was opened in a week’s time, but the golf course took months to bring back. Perhaps even more remarkable than the coming of the floods was Shawnee’s recovery – only losing one green total on the golf courses. “The physical recovery is much different than the business recovery and reenergizing your group business and Country Club,” said Howell. Shoveling mud is one thing – getting people to come back is another matter entirely. But come back they have. The Inn was bustling with activity during our visit, with guests enjoying the great outdoors along with the fine and casual dining experiences offered at the Resort. With our focus on golf, we did not have time to enjoy many of the non-golf activities at Shawnee, but there’s enough there for a lengthy stay. More recent celebrity visits to Shawnee include Ivy League Presidents, several different governors, the band Kiss, ZZ Top, Rueben Studdard and a few others. One note – don’t go to the Shawnee Inn expecting it to compete with places like the Greenbrier and the Homestead. Shawnee is more low-key than some historic-type resorts, but it also comes with a much more reasonable price tag – not to mention that it’s more family friendly. That’s not a small consideration these days, when budgets are stretched and people must make choices on how to spend their money. There’s little doubt about that. 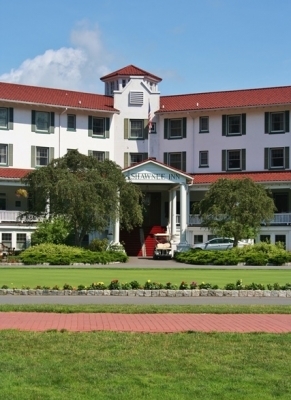 The Shawnee Inn and Golf Resort is well worth the drive from points in the Mid-Atlantic, and is readily accessible to a large chunk of the population of the east coast. Golfers should definitely consider it a destination worth looking into. Click here for an in-depth story on the Shawnee golf courses.